The word count feature on a text editor is pretty helpful in some cases. For instance, you are writing a draft for your blog and want to know how many words you have been typed. Google Docs has a word count feature, yet not visible and there is no option to make it visible. To view the word count on Google Docs you can go to the Tools menu and select Word count. Or, you can also use the Google Docs shortcut by pressing Ctrl+Shift+C keys on your keyboard. 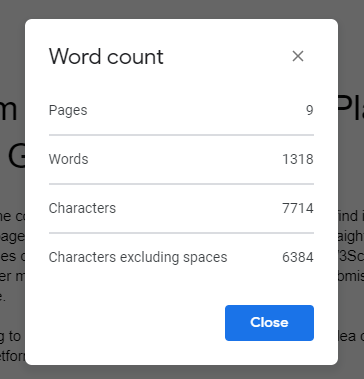 The word count feature on Google Docs will display four stats: the number of pages, words, characters and characters without space. 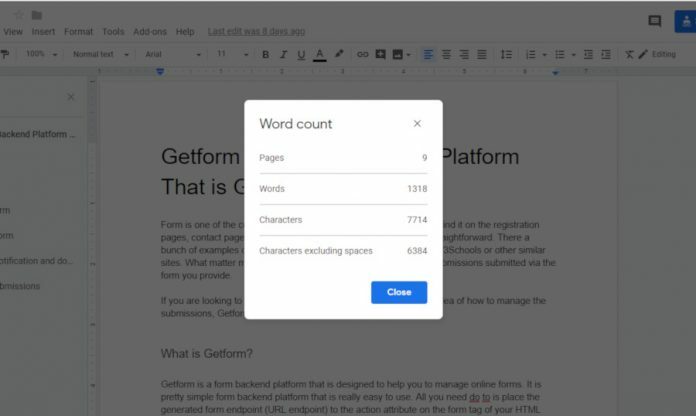 Unlike other word processors like LibreOffice Writer and Microsoft Word, Google Docs has no status bar to display the word count in real-time. The only way to figure out how many words you have been typed is via the Tools menu by selecting the Word count option. However, Google Docs has an open ecosystem, allowing third party developers to develop add-ons to enhance the functionality of Google Docs itself. Better Word Count is an add-on developed by third party developer that allows you to view the word count in real-time. This add-on will display the word count in a sidebar because, once again, Google Docs doesn’t support status bar. Better Word Count allows you to select which document sections you want to exclude. Like footer, header or footnote. You can visit this page to install it in case you are interested.